For other uses, see Edsel (disambiguation). The Edsel is an automobile marque that was planned, developed, and manufactured by the Ford Motor Company for model years 1958–1960. With the Edsel, Ford had expected to make significant inroads into the market share of both General Motors and Chrysler and close the gap between itself and GM in the domestic American automotive market. Ford invested heavily in a yearlong teaser campaign leading consumers to believe that the Edsel was the car of the future – an expectation it failed to deliver. After it was unveiled to the public, it was considered to be unattractive, overpriced, and overhyped. The Edsel never gained popularity with contemporary American car buyers and sold poorly. The Ford Motor Company lost $250 million on the Edsel's development, manufacturing, and marketing. The very name "Edsel" became a popular symbol for a commercial failure. Ford Motor Company became a publicly traded corporation on January 17, 1956, and thus was no longer entirely owned by members of the Ford family. The company was now able to sell cars according to current market trends following the sellers' market of the postwar years. Ford's new management compared the company's roster of makes with that of General Motors and Chrysler, and concluded that Lincoln was competing not with Cadillac, but with Oldsmobile, Buick and DeSoto. Ford developed a plan to move Lincoln upmarket, with the Continental broken out as a separate make at the top of Ford's product line, and to add a premium/intermediate vehicle to the intermediate slot vacated by Lincoln. Marketing research and development for the new intermediate line had begun in 1955 under the code name "E car", which stood for "experimental car." Ford Motor Company eventually decided on the name "Edsel", in honor of Edsel B. Ford, son of the company's founder, Henry Ford (despite objections from Henry Ford II). The proposed vehicle marque would represent the start-up of a new division of the firm alongside that of Ford itself and the Lincoln-Mercury division, whose cars at the time shared the same bodies. Ford later claimed to have performed more than adequate, if not superior, product development and market research work in the planning and design of the new vehicle. Particularly Ford assured its investors, and the Detroit automotive press, that the Edsel was not only a superior product (as compared to its Oldsmobile/Buick competition), but the details of its styling and specifications were the result of a sophisticated market analysis and research and development effort that would essentially guarantee its broad acceptance by the buying public when the car was introduced. The Edsel was introduced amid considerable publicity on "E Day"—September 4, 1957. It was also promoted by a top-rated television special, The Edsel Show, on October 13, but the promotional effort was not enough to counter the adverse initial public reaction to the car's styling and conventional build. The day after its launch, the Edsel was described as a "reborn LaSalle," a brand that had disappeared in 1940. For months, Ford had been telling the industry press that it "knew" (through its market research) that there would be great demand for the vehicle. Ford also insisted that, in the Edsel, it had built exactly the "entirely new kind of car" that Ford had been leading the buying public to expect through its pre-introduction publicity campaign for the car. In reality, however, the Edsel shared its engineering and bodywork with other Ford models, and the similarities were apparent once the vehicle was viewed firsthand. The Edsel was to be sold through a newly formed division of the Ford Motor Company, as a companion to the Ford Division, Mercury Division, Lincoln Division and (newly formed but also short-lived) Continental Division. Each division had its own retail organization and dealer network. The free-standing Edsel Division existed from November 1956 until January 1958, after which Edsel sales and marketing operations were integrated into the Mercury-Edsel-Lincoln division (referred to as M-E-L). Initially Edsel was sold through a new network of approximately 1,187 dealers. This briefly brought the total number of dealers of all Ford products to 10,000. Ford saw this as a way to come closer to parity with Chrysler, which had 10,000 dealers, and General Motors, which had 16,000. As soon as it became apparent that the Edsels were not selling, many of these dealers added Lincoln-Mercury, Ford of Britain, or Ford of Germany franchises to their dealerships with the encouragement of Ford Motor Company. Some dealers, however, closed. For the 1958 model year, Ford produced four submodels of Edsel: The larger Mercury-based Citation and Corsair, and the smaller Ford-based Pacer and Ranger. The Citation was offered in two-door and four-door hardtop and two-door convertible versions. The Corsair was available in two-door and four-door hardtop versions. The Pacer was available as a two-door or four-door hardtop, four-door sedan, or two-door convertible. The Ranger was sold in two-door and four-door hardtop or sedan versions. The four-door Bermuda and Villager wagons and the two-door Roundup wagon were based on the 116-inch wheelbase Ford station wagon platform and shared the trim and features of the Ranger and Pacer models. The Edsel offers several of what were then considered innovative features, among which are its rolling-dome speedometer; warning lights for such conditions as low oil level, parking brake engaged, and engine overheating; and its push-button Teletouch transmission shifting system in the center of the steering wheel (a conventional column-shift automatic was also available at a reduced price). Other Edsel design innovations include ergonomically designed controls for the driver and self-adjusting brakes (which Ford claimed for the Edsel as a first for the industry, even though Studebaker had pioneered them earlier in the decade). The Edsel also offers such features, advanced for the time, as seat belts (which were available at extra cost as optional equipment on many other makes) and child-proof rear door locks that could only be opened with the key. Unlike Ford and Mercury, the Edsel division never had any dedicated manufacturing plants. All Edsels were built in Ford or Mercury plants on a contract basis. In the first year, 63,110 Edsels were sold in the United States, and 4,935 were sold in Canada. Though below expectations, this nevertheless represented the second-largest launch for any new car brand to date, exceeded only by the Desoto introduction in 1929. For the 1959 model year, the Edsel brand fielded only two series, the Ford-based Ranger and Corsair. The larger Mercury-based Edsels were discontinued. Replacing the Pacer as the top-line Ford-based Edsel, the new Corsair was offered as a two-door and four-door hardtop, four-door sedan, and two-door convertible. The Ranger was sold as a two-door and four-door hardtop, two-door and four-door sedan, and the Villager station wagon. In the 1959 model year, 44,891 Edsels were sold in the U.S., and 2,505 were sold in Canada. For the 1960 model year, Edsel's last, only 2,846 vehicles were produced. All but the pilot cars were assembled at the Louisville, Kentucky assembly plant. The marque was reduced to the Ranger series of sedans, hardtops, convertibles, and the Villager station wagons. The Edsel shares a basic chassis, glass, and major sheet metal with the 1960 Ford Galaxie and Fairlane models that were built on the Louisville assembly line with it. But the Edsel has its own unique grille, hood, and four upright oblong taillights, along with its side-sweep spears. The Edsel's front and rear bumpers are also unique. The 1960 Edsel rides on a 120-inch wheelbase, compared to the concurrent Ford's 119-inch span, and it also uses a different rear suspension. The cars do, however, share engines and transmissions. The 1960 Edsel Ranger four-door hardtop model used the thin-pillar Ford Fairlane four-door sedan roofline, as opposed to the "square" roof-line used on the corresponding Ford four-door hardtop, which was exclusive to the Galaxie line. The Galaxie four-door hardtop's rear door trim panel, however, was fitted to the Ranger. This gave the Edsel four-door hardtop a unique body style that was never offered on any 1960 Ford. Ford announced the end of the Edsel program on Thursday, November 19, 1959. However, production continued until late in November, with the final tally of 2,846 model year 1960 cars. Total Edsel sales were approximately 116,000, less than half the company's projected break-even point. The company lost $350 million, or the equivalent of $2,800,000,000 in 2016 dollars, on the venture. Only 118,287 Edsels were built, including 7,440 produced in Ontario, Canada. By U.S. auto industry standards, these production figures were dismal, particularly when spread across a run of three model years. On Friday, November 20, United Press International's (UPI) wire service reported that book values for used Edsels had declined by as much as $400 based on condition and age immediately following the Ford press release. In some newspaper markets, dealers scrambled to renegotiate newspaper advertising contracts involving the 1960 Edsel models, while others dropped the name from their dealerships' advertising entirely. Ford issued a statement that it would distribute coupons to customers who purchased 1960 models (and carryover 1959 models) prior to the announcement, valued at $300 to $400 toward the purchase of new Ford products to offset the decreased values. The company also issued credits to dealers for stock unsold or received following the announcement. Historians have advanced several theories in an effort to explain the Edsel's failure. Popular culture often faults the car’s styling. Consumer Reports has alleged that poor workmanship was the Edsel's chief problem. Marketing experts hold the Edsel up as a supreme example of the corporate culture’s failure to understand American consumers. Business analysts cite the weak internal support for the product inside Ford’s executive offices. According to author and Edsel scholar Jan Deutsch, the Edsel was "the wrong car at the wrong time." The Edsel is most notorious for being a marketing disaster. Indeed, the name "Edsel" became synonymous with the "real-life" commercial failure of the predicted "perfect" product or product idea. Similar ill-fated products have often been colloquially referred to as "Edsels". Ford's own Sierra model, which launched almost 25 years later, is often compared to the Edsel owing to initial buyer antipathy to its perceived radical styling, even though, unlike the Edsel, it was ultimately a sales success. Since the Edsel program was such a debacle, it gave marketers a vivid illustration of how not to market a product. The principal reason the Edsel's failure is so infamous is that Ford had absolutely no idea that the failure was going to happen until after the vehicles had been designed and built, the dealerships established and $400 million invested in the product's development and launch. Incredibly, Ford had presumed to invest $400 million (well over $4.0 billion in the 21st century) in developing a new product line without attempting to determine whether such an investment would be wise or prudent. The prerelease advertising campaign promoted the car as having "more YOU ideas", and the teaser advertisements in magazines only revealed glimpses of the car through a highly blurred lens or wrapped in paper or under tarps. In fact, Ford had never “test marketed” the vehicle or its unique styling concepts with potential, “real” buyers prior to either the vehicle’s initial development decision or the vehicle’s shipments to its new dealerships. Edsels were shipped to the dealerships undercover and remained wrapped on the dealer lots. The public also had difficulty understanding what the Edsel was, primarily because Ford made the mistake of pricing the Edsel within Mercury’s market price segment. Theoretically, the Edsel was conceived to fit into Ford’s marketing plans as the brand slotted in between Ford and Mercury. However, when the car debuted in 1958, its least expensive model—the Ranger—was priced within $73 of the most expensive and best-trimmed Ford sedan and $63 less than Mercury’s base Medalist model. In its mid-range pricing, Edsel's Pacer and Corsair models were more expensive than their Mercury counterparts. Edsel's top-of-the-line Citation four-door hardtop model was the only model priced to correctly compete with Mercury’s mid-range Montclair Turnpike Cruiser model, as illustrated in the chart below. Not only was the Edsel competing against its own sister divisions, but model for model, buyers did not understand what the car was supposed to be—a step above the Mercury, or a step below it. After its introduction to the public, the Edsel did not live up to its preproduction publicity, even though it did offer many new features, such as self-adjusting rear brakes and automatic lubrication. While Ford's market research had indicated that these and other features would make the "E" car attractive to them as car buyers, the Edsel's selling prices exceeded what buyers were willing to pay. Upon seeing the price for a base model, many potential buyers simply left the dealerships. Other customers were frightened by the price for a fully equipped top-of-the-line model. One of the external forces working against the Edsel was the onset of an economic recession in late 1957. Compounding Edsel's problems was the fact that the car had to compete with well-established nameplates from the Big Three, such as Pontiac, Oldsmobile, Buick, Dodge and DeSoto, as well as with its own internal sister division Mercury, which itself had never been a stellar sales success. To make matters still worse, as a new make, Edsel had no established brand loyalty with buyers, as its competing makes had. Even if the 1957–1958 recession had not occurred, the Edsel would have been entering a shrinking marketplace. In the early 1950s, when the "E" car was in its earliest stages of development, Ford Executive Vice President Ernest R. Breech had convinced Ford management that the medium-priced market segment offered great untapped opportunity. At the time, Breech's assessment was basically correct; in 1955, Pontiac, Buick and Dodge had sold a combined two million units. But by the fall of 1957, when the Edsel was introduced, the market had changed drastically. Independent manufacturers in the medium-priced field were drifting toward insolvency. Hoping to reverse its losses, Packard acquired Studebaker, which was also in financial difficulty. The board decided to stop production under the venerable Packard badge after 1958. The 1957–58 Packards were little more than Studebakers badged as Packards. Attempting to capitalize on the emerging consumer interest in economy cars, American Motors shifted its focus to its compact Rambler models and discontinued its pre-merger brands, Nash and Hudson, after the 1957 model year. Sales of Chrysler's DeSoto marque dropped dramatically from its 1957 high by over 50% in 1958. When DeSoto sales failed to rebound during the 1959 model year, plans were made in Highland Park to discontinue the nameplate by 1961. Indeed, sales for most car manufacturers, even those not introducing new models, were down. Among domestic makes, only Rambler and Lincoln produced more cars in 1958 than in 1957. Customers started buying more fuel-efficient automobiles, particularly Volkswagen Beetles, which were selling at rates exceeding 50,000 a year in the U.S. from 1957 onward. Edsels were equipped with powerful engines and offered brisk acceleration, but they also required premium fuel, and their fuel economy, especially in city driving, was poor even by late-1950s standards. Ford Motor Company had conducted the right marketing study, but it came up with the wrong product to fill the gap between Ford and Mercury. By 1958, buyers had become fascinated with economy cars, and a large car like the Edsel was seen as too expensive to buy and own. When Ford introduced the Falcon in 1960, it sold over 400,000 units in its first year. Ford's investment in expanded plant capacity and additional tooling for the Edsel helped make the company's subsequent success with the Falcon possible. By 1965, the market for medium-priced cars had recovered, and this time, Ford had the right car: the Galaxie 500 LTD. The LTD's success led Chevrolet to introduce the Caprice as a mid-1965 upscale trim option on its top-of-the-line Impala four-door hardtop. The name of the car, Edsel, is also often cited as a further reason for its lack of popularity. Naming the vehicle after Edsel Ford was proposed early in its development. However, the Ford family strongly opposed its use. Henry Ford II declared that he did not want his father's good name spinning around on thousands of hubcaps. Ford also ran internal studies to decide on a name, and even dispatched employees to stand outside movie theaters to poll audiences as to what their feelings were on several ideas. They reached no conclusions. Ford retained the advertising firm Foote, Cone & Belding to come up with a name. When the agency issued its report, citing over 6,000 possibilities, Ford's Ernest Breech commented that they had been hired to develop one name, not 6,000. Early favorites for the name brand included Citation, Corsair, Pacer, and Ranger, which were ultimately chosen for the vehicle's series names. David Wallace, manager of marketing research, and coworker Bob Young unofficially invited freethinker poet Marianne Moore for input and suggestions. Moore's unorthodox contributions (among them "Utopian Turtletop," "Pastelogram," "Turcotinga," "Resilient Bullet," "Andante con Moto" and "Mongoose Civique") were meant to stir creative thought and were not officially authorized or contractual in nature. By the instruction of Ernest Breech, who was chairing a board meeting in the absence of Henry Ford II, the car was finally called "Edsel" in honor of Edsel Ford, former company president and son of Henry Ford. Even though the Edsel shared its basic technology with other Ford products, a number of issues caused reliability problems, mostly with the 1958 models. Reports of mechanical flaws with the cars surfaced, due primarily to lack of quality control and confusion of parts with other Ford models. Ford never dedicated a stand-alone factory solely to Edsel model production. The first-year (1958) Edsels were assembled in both Mercury and Ford factories. The longer-wheelbase models, Citation and Corsair, were produced alongside the Mercury products, while the shorter-wheelbase models, Pacer and Ranger, were produced alongside the Ford products. Workers assembling Fords and Mercurys often found the task of assembling the occasional Edsel that moved down the line burdensome, since it required them to change tools and parts bins, then switch back to resume assembling Fords or Mercurys after completing assembly on the Edsel. The workers were also expected to accommodate Edsel assembly with no adjustment in their hourly quota of Ford and Mercury production. Consequently, the desired quality control of the different Edsel models proved difficult to achieve, even when the Fords and Mercurys were satisfactorily assembled on the same lines. Many Edsels actually left the assembly lines unfinished. Uninstalled parts were placed in the trunks along with installation instructions for dealership mechanics, some of whom never installed the additional parts at all. Some dealers did not even receive all the parts. In the March 1958 issue of Popular Mechanics, 16% of Edsel owners reported poor workmanship, with complaints ranging from faulty welding to power steering failure. In its test car, Popular Mechanics tested for these problems and noted others, such as the trunk leaking badly in a storm and the odometer showing fewer than actual miles traveled. The distinctive center grille of the 1958 Edsel. The Edsel's front-end ensemble as it eventually appeared bore little resemblance, if any, to the original concept. Roy Brown, the original chief designer on the Edsel project, had envisioned a slender, almost delicate opening in the center. Engineers, fearing engine cooling problems, vetoed the intended design, which led to the now-infamous "horsecollar." The vertical grille theme, while improved for the 1959 models, was discontinued for the 1960 models, which were similar to Ford models of the same year, although coincidentally, the new front-end design was very similar to that of the 1959 Pontiac. The Teletouch pushbutton automatic transmission selector was an extremely complex feature. 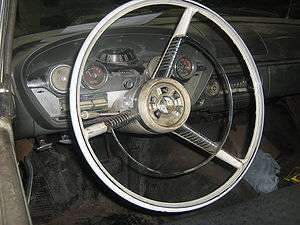 It proved problematic in part because the steering wheel hub, where the pushbuttons were located, was the traditional location of the horn button. Some drivers inadvertently shifted gears when they intended to sound the horn. While the Edsel was fast, the location of the transmission pushbuttons was not conducive to street racing. There were also jokes among stoplight drag racers about the buttons: D for Drag, L for Leap, and R for Race (instead of Drive, Low and Reverse). The control wires for Teletouch were also routed too close to the exhaust manifold, which often caused unpredictable movement of the selector mechanism and, in some cases, complete failure. The electrical design required drivers to shift from Park to Reverse to Neutral to Drive, in that order, to avoid overloading the Teletouch motor. The motor was also not powerful enough to bring the car out of Park while on a hill, so dealerships would instruct drivers to set the parking brake before pushing the Park button. Complaints also surfaced about the taillights on 1958-model Edsel station wagons. The lenses were boomerang-shaped and placed in a reverse fashion. At a distance, they appeared as arrows pointed in the opposite direction of the turn being made. When the left turn signal flashed, its arrow shape pointed right, and vice versa. However, there was little that could be done to give the Ford-based station wagons a unique appearance from the rear, because corporate management had insisted that no sheetmetal could be changed. Only the taillights and trim could be touched. There was room for separate turn signals in addition to the boomerangs, but the U.S. industry had never supplied them up to that point, and they were probably never seriously considered. Mechanics of the time were wary of the 410-cubic-inch Edsel "E-475" engine because its perfectly flat cylinder heads lacked distinct combustion chambers. The heads were set at an angle, with "roof" pistons forming both a squish zone on one side and a combustion chamber on the other. Combustion thus took place entirely within the cylinder bore. This design was similar to Chevrolet's 348-cubic-inch "W" engine, which was also introduced in 1958. While the design reduced the cost of manufacture and may also have helped minimize carbon buildup, it was also unfamiliar to many mechanics. An intriguing aspect of the Edsel story is that it provides a case study in how company politics can kill an idea. While the car and Ford’s planning of the car are the most often cited reasons for its failure, internal Ford Motor Company memoranda indicate that the Edsel may actually have been a victim of dissension within Ford's management ranks. Following World War II, Henry Ford II retained Robert McNamara as one of the "Whiz Kids" to help turn Ford around. McNamara’s cost-cutting and cost-containment skills helped Ford emerge from its near-collapse after the war. As a result, McNamara eventually amassed a considerable amount of power at Ford. McNamara was very much a throwback to Henry Ford in that, like the elder Ford, McNamara was committed to the Ford marque to the almost total exclusion of the company's other products. Thus, McNamara had little use for the Continental, Lincoln, Mercury and Edsel brand cars made by the company. McNamara opposed the formation of the separate divisions for Continental, Lincoln, Mercury, and Edsel cars, and moved to consolidate Lincoln, Mercury, and Edsel into the M-E-L division. McNamara saw to it that the Continental program was canceled and that the model was merged into the Lincoln range for 1958. He next set his sights on Edsel by maneuvering for elimination of the dual wheelbases and separate bodies used in 1958. Instead, the Edsel would share the Ford platform and use Ford’s inner body structure for 1959. In 1960, the Edsel emerged as little more than a Ford with different trim. McNamara also moved to reduce Edsel’s advertising budget for 1959, and for 1960, he virtually eliminated it. The final blow came in the fall of 1959, when McNamara convinced Henry Ford II and the rest of Ford's management that the Edsel was doomed and that it was time to end production before the Edsel bled the company dry. McNamara also attempted to discontinue the Lincoln nameplate, but that effort ended with Elwood Engel's now classic redesign of 1961. McNamara left Ford when he was named Secretary of Defense by President John F. Kennedy. During the 1964 presidential election, Republican nominee Barry Goldwater blamed McNamara, then Secretary of Defense, for the Edsel's failure. Eventually, Ford's former executive vice president Ernest R. Breech, who was a financial contributor to Goldwater, wrote to the Senator's campaign, explaining that "Mr. McNamara… had nothing to do with the plans for the Edsel car or any part of the program." However, the charge continued to be leveled against McNamara for years. During his time as head of the World Bank, McNamara instructed his public affairs officer to distribute copies of Breech's letter to the press whenever the accusation was made. The scheduled 1960 Edsel Comet compact car was hastily rebranded as the Comet and assigned to Lincoln-Mercury dealerships as a stand-alone product. Based on the new-for-1960 Ford Falcon, the Comet was an instant success, selling more cars in its first year than all models of Edsel produced during that marque's entire three-year run. Styling touches seen in the Comets sold to the public that allude to being part of the Edsel family of models included the instrument cluster, rear tailfins (though canted diagonally), and the taillight shape (the lens is visually similar to that used on the 1960 Edsel, and even retained the embossed "E" part code). The Comet's keys were even shaped like Edsel keys, with the center bar removed from the "E" to form a "C."
For 1962, Ford officially assigned the Comet to the Mercury brand. The Mercury name does not appear anywhere on the 1960 and 1961 models. More than half a century after its spectacular failure, the Edsel has become a highly collectible item among vintage car hobbyists. Fewer than 10,000 Edsels survive and they are considered valuable collectors’ items. A mint-condition Edsel convertible from any of its three model years may sell for over $100,000. The rarest Edsel is the 1960 Ranger convertible, only 76 were built. Approximately 25 survive today. While the design was considered "weird" or "too different" by its contemporaries, many other car manufacturers (such as Pontiac, Jaguar, BMW, Subaru, Lancia, Alfa Romeo, and Saab) have employed similar vertical grilles successfully in their car designs. Many of the Edsel's features, such as self-adjusting brakes, gear selection by steering wheel buttons, etc., which were considered "too impractical" in the late 1950s, are now standard features of sports cars. Plastic scale models of all three Edsel years were produced by Aluminum Metal Toys (AMT), in its familiar 1/25 scale. Both promotional and kit versions were sold. These command premium prices today, especially the rare 1959 and 1960 models. The 1958 Pacer hardtop was re-issued as a totally new and much more detailed kit by AMT in the 1990s. The 1960 hardtop is also available as a resin kit from several resin model producers, but is typically priced close to the cost of an original kit. Yat Ming, a producer of diecast model cars, offered a nicely detailed 1958 Citation in 1/18 scale in both hardtop and convertible body styles. Yat Ming also produced a detailed 1/43 scale diecast of the Citation convertible in several color combinations. The Franklin Mint produced highly detailed 1/24 scale and 1/43 scale diecast models of the 1958 Citation convertible. The Danbury Mint produced a 1/24 scale diecast replica of the 1958 Bermuda station wagon, complete with accurately detailed wood trim. Despite the Edsel's lack of sales success, several of the cars were nevertheless raced in NASCAR's Grand National series in the late 1950s. ↑ Yardley, William. "Roy Brown Jr., Edsel Designer, Dies at 96". Retrieved 17 August 2016. ↑ Dicke, Tom (2010). "The Edsel: Forty years as a symbol of failure". Journal of Popular Culture. 43 (3): 486–502. ↑ "1959 Edsel Ads". edsel.net. Retrieved 7 July 2012. ↑ Henry, Jim (16 June 2003). "Henry Ford never wanted his company to go public". autonews.com. Retrieved 30 August 2015. 1 2 3 4 Warnock, C Gayle (1980). The Edsel Affair. Pro West. ↑ "This is the Edsel (advertisement)". Life. 1957-11-11. pp. 90–91. Retrieved February 22, 2013. ↑ "Slowest Market of Year Declines; 1,260,000 Shares Traded--Average Drops 2.68 Points to 313.73 OILS, MOTORS RETREAT Steels, Metals, and Aircrafts [sic] Also Weak--Coal Issues Are Under Pressure Experts Bemused Oils Beat Retreat". The New York Times. 1957-09-05. 1 2 Flory, Jr., J. "Kelly" (2008). American Cars, 1946–1959 Every Model Every Year. McFarland & Company, Inc., Publishers. ISBN 978-0-7864-3229-5. ↑ "Directory Index: Edsel/1958_Edsel/1958_Edsel_Foldout". OldCarBrochures.com. Retrieved 2011-11-08. ↑ "Directory Index: Edsel/1958_Edsel/1958_Edsel_Sell-O-Graph". OldCarBrochures.com. Retrieved 2011-11-08. ↑ Collier, Peter; Horowitz, David (1987). The Fords: An American Epic. Summit Books. p. 263. ISBN 9780671540937. 1 2 The Auto Editors of Consumer Guide (2006). Encyclopedia of American Cars: A Comprehensive History of the American Automakers From 1930 to Today. Publications International. p. 374. ↑ "HowStuffWorks "1955–1959 Volkswagen Beetle"". Auto.howstuffworks.com. Retrieved 2009-05-17. ↑ The Auto Editors of Consumer Guide (2006). Encyclopedia of American Cars: A Comprehensive History of the American Automakers From 1930 to Today. Publications International, Ltd. p. 375. ↑ "Edsel Power, Handling, Are Tops, Say Owners". Popular Mechanics. 109 (3): 90–95. March 1958. Retrieved 7 July 2012. ↑ "Autos: The $250 Million Flop". Time. 30 November 1959. Retrieved 2011-01-30. ↑ Neil, Dan (2007-09-07). "The 50 Worst Cars of All Time – 1958 Ford Edsel". time.com. Retrieved 7 July 2012. ↑ McNamara, Robert (1995). In Retrospect: The Tragedy and Lessons of Vietnam. Random House. p. 150. ISBN 9780679767497. ↑ View all comments that have been posted about this article. "The Flop Heard Round the World". Washingtonpost.com. Retrieved 2009-05-17. Barron, James (2007-08-01). "To Ford, a Disaster. To Edsel Owners, Love.". The New York Times. Bonsall, Thomas E. (2002). Disaster in Dearborn: The Story of the Edsel. Stanford University Press. ISBN 978-0804746540. Brooks, John. "The Fate of the Edsel" in Business Adventures. New York: Open Road, 2014 edition, ISBN 9781497644892. Daines, Robert (1994). Edsel: The Motor Industry's Titanic. Academy Books. ISBN 978-1873361191. Deutsch, Jan (1976). The Edsel and Corporate Responsibility. Yale University Press. Lacey, Robert (1988). Ford: The Men and the Machine. Little Brown and Company. The Auto Editors of Consumer Guide (2006). Encyclopedia of American Cars: A Comprehensive History of the American Automakers From 1930 to Today. Publications International, Ltd.
Warnock, C Gayle (1980). The Edsel Affair.. What Went Wrong. Pro West. Warnock, C Gayle (2007). The Rest of the Edsel Affair. AuthorHouse. ISBN 978-1434332905. Wikimedia Commons has media related to Edsel vehicles (category). Edsels in the Media Listing of Edsel references in popular culture. Edsel Promo Time A Web site devoted to plastic dealer promotional models of Edsels. "All About Ford's Luxury Loaded Edsel." Popular Science, September 1957, pp. 98–103/282-283.